Roulette was first played in Paris in 1796, and it is a very simple game to play. Whether you play in a real land-based casino or online, the setup, the rules, and the odds, remain unchanged. If you play online, then it is best to only play at online casinos that offer live dealer roulette. The game of roulette is setup with a roulette table, a roulette wheel, and a croupier who spins the ball. Players usually sit at the table on the opposite side of the croupier. Every roulette table has a minimum bet and a maximum bet for both inside and outside bets. To start playing, players put cash on the table. The croupier counts the cash and gives an equivalent amount of colored chips back to the player. Every player’s chips have a different color so that there is no confusion as to whose chips are on the table layout. Furthermore, the patterns on the chips vary from table to table so there is no possible confusion between players who may have the same color chips. In any case, a player cannot use chips from one table on another table. During a game of roulette, the croupier will call out, ‘place your bets please’, and players will begin placing their bets on the table. The croupier will usually give players sufficient time to place their bets before spinning the little white ball. Even after the croupier spins the ball, players can usually still continue placing bets as the ball decelerates, until a point when the croupier will call out ‘no more bets, thank you’, and will then prevent anyone from placing any more bets on the table as the ball begin to drop. When the ball drops, it doesn’t just drop right into a pocket on the wheel. As it decelerates, there are diamond studs along the surrounding edge of the roulette wheel that will randomly deflect it. This results in the ball bouncing chaotically along the spinning wheel before finally settling into a pocket. The winning number is the pocket where the ball lands. The croupier will immediately call out the winning number and will either place a dolly on top of the chips on the winning number, or on the winning number on the table layout if there are no chips on that number. The croupier will clear all losing bets from the table layout before paying out winning bets. Players usually cannot place new bets until the croupier pays out all winning bets. 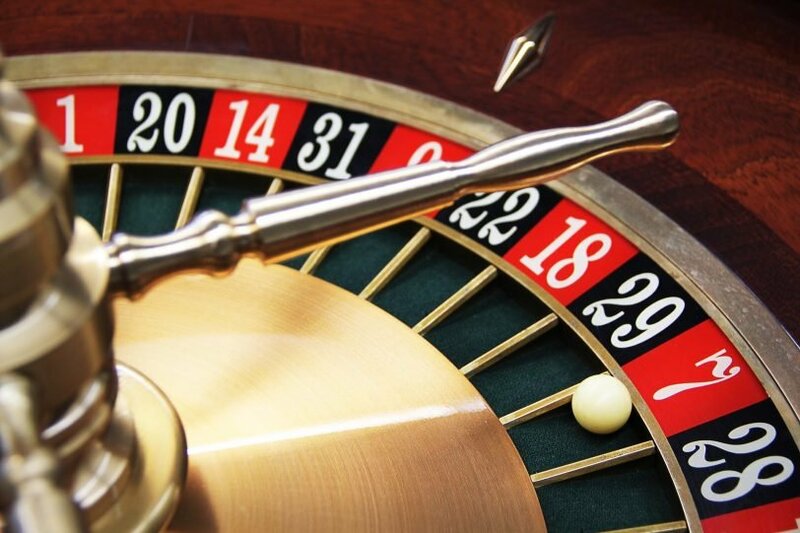 The most common roulette wheels are the European roulette wheel with 37 numbers and the American version with 38 numbers. The European roulette wheel has numbers from 0 to 36, whereas, the American one has an additional double zero, 00. The odds and payout, however, are the same for both versions. Given a choice, it is best to play on a European wheel as the house edge will be lower. A: The Straight Bet is a bet made on a single number. The chip is placed on a single number right in the middle of a number square. The odds of winning this bet is 1 in 37 with a payout of 35 to 1. That means you will be paid 35 times your bet plus the bet itself. If you placed one chip on the winning number, you will get back a total of 36 chips i.e. 35 in winnings plus your bet of 1. B: The Split Bet is a bet made on two numbers. Eg. 7-10 or 7-8 as depicted in the image above. Chip(s) must be placed on the line between the chosen numbers. The odds of winning a split bet is 1 in 18.5 with a payout of 17 to 1 on a win. That means you will be paid 17 times your bet plus the bet itself. If you placed one chip on the 7 – 8 split as shown above, you will get back a total of 18 chips i.e. 17 in winnings plus your bet of 1 if the winning number is either 7 or 8. C: The Street Bet is a bet placed on any three numbers. The chip is placed on the edge of the line of the three numbers i.e. for the line 13 – 14 – 15, it is placed on the edge of 15 as shown above. The odds of winning this bet is 1 in 12.33 with a payout of 11 to 1. That means you will be paid 11 times your bet plus the bet itself. If you placed one chip as shown above, and if the winning number is either 13, 14 or 15, you will get back a total of 12 chips i.e. 11 in winnings plus your bet of 1 chip. Take note that there are 2 other bets with the same odds and payout, but are not in a straight line. They are 0, 1 and 2 and 0, 2 and 3. E: The Six Line Bet is a bet on two bordering streets, with the chip placed at the corresponding intersection. As per the image above, 25, 26, 27, 28, 29 and 30. The odds of winning this bet is 1 in 6.17 with a payout of 5 to 1. That means you will be paid 5 times your bet plus the bet itself. If you placed 1 chip as shown above, and if the winning number is either 25, 26, 27, 28, 29, or 30, you will get back a total of 6 chips i.e. 5 in winnings plus your bet of 1 chip. F: The Dozen Bet is a bet on the first dozen, or 1st 12 (1-12), second dozen, or 2nd 12 (13-24), or the third dozen, 3rd 12 (25-36). The payout is 2 to 1. That means you will be paid 2 times your bet plus the bet itself. If you placed 1 chip on the 1st 12 and won, you will get back a total of 3 chips i.e. 2 in winnings plus your bet of 1 chip. Similarly, The Column Bet (2 to 1) is a bet on all 12 numbers of any of the three vertical lines (eg. the 1st column 1, 4, 7, 10 down to 34). The chip is placed on the space below the final number in the column in the box marked (2 to 1). The payout is 2 to 1, exactly the same as for the Dozen Bets. G: The Red or Black Bet is a bet on whether the color red or black will show up on the roulette wheel. The payout is also 1 to 1. H: The Even or Odd Bet is a bet on an even or odd number showing up. The payout is again, 1 to 1. J: The 1 to 18 Bet is a bet that covers the eighteen numbers 1 – 18, also known as the Low Numbers. The payout is 1 to 1. That means you will be paid the exact amount you bet plus the bet itself. If you placed 1 chip on 1 – 18 and won, you will get back a total of 2 chips i.e. 1 in winnings plus your bet of 1 chip. Similarly, The 19 to 36 Bet is a bet that covers the eighteen numbers 19 – 36, also known as the High Numbers. Payout is 1 to 1, exactly the same as for the Low Numbers, 1 – 18. It is important to note that table minimums and maximums differ for inside and outside bets. Inside bets are usually based on the value of a single color chip for the table. Outside bets usually have a higher minimum like $25 or $50 (if the color chips are say, $5 or $10), and varies from casino to casino. The above odds and payout and the variety of bets may seem daunting but with a bit of observation and practice (via online casinos), it is fairly easy to quickly grasp the ins and outs of the game. The more difficult task would be knowing how to win consistently and that would require sound bet selection and betting strategies! Previous PostSpecial Year End Offer!